Hi there ribbon lovers. 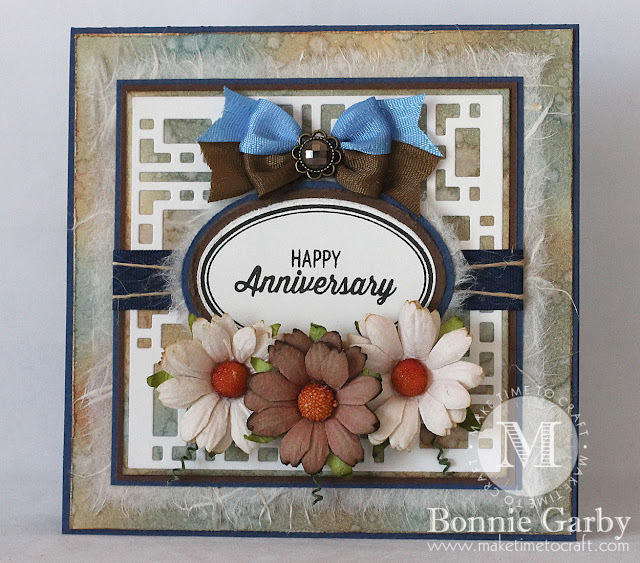 Bonnie here today sharing a pretty anniversary card I made for my sister-in-law and brother-in-law showcasing some pretty ribbon, embellishments and mulberry flowers from Really Reasonable Ribbon. Since I was using some Distress Ink papers that I had already made, this was a pretty quick card to put together. I cut my background die and layered it on the Distress Ink paper and then added a brown and navy blue layer with a final layer of natural mulberry paper at the bottom.. I then wrapped a piece of Navy Diamond Satin Ribbon across the center and topped that with Natural Burlap String. This panel was then attached to a 5-1/2" square navy blue card base that was topped with a piece of my Distress Ink paper. 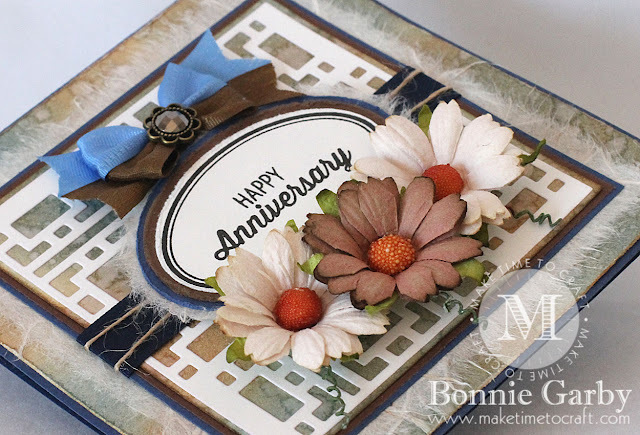 My sentiment was stamped and die cut and layered again on brown and navy cardstock with a final layer of natural mulberry paper at the bottom. The sentiment was attached to the card front with 3D Foam Tabs. I added three Chrysanthemums from the Mixed Earth Tone Chrysanthemum Assortment under my sentiment. I curled the wire around a needle tool before I added them. These chrysanthemums some in a variety of colors and are a great addition to any project. My pretty bi-color bow was created on my Bow-it-All V3.0 Tool using Turftan Brown and Capri Blue Delicate Stitched Satin Ribbon. For a video tutorial on how I made this pretty bow, please click HERE. Thanks so much for stopping by today. 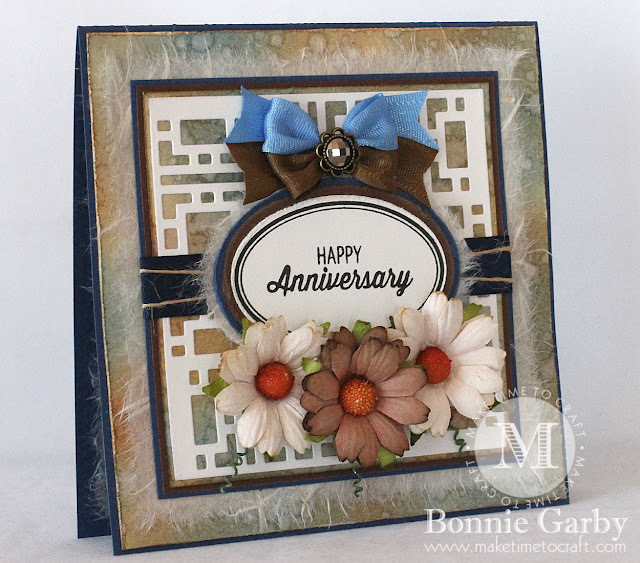 For more information on the other products on my card, please visit my Make Time to Craft Blog. 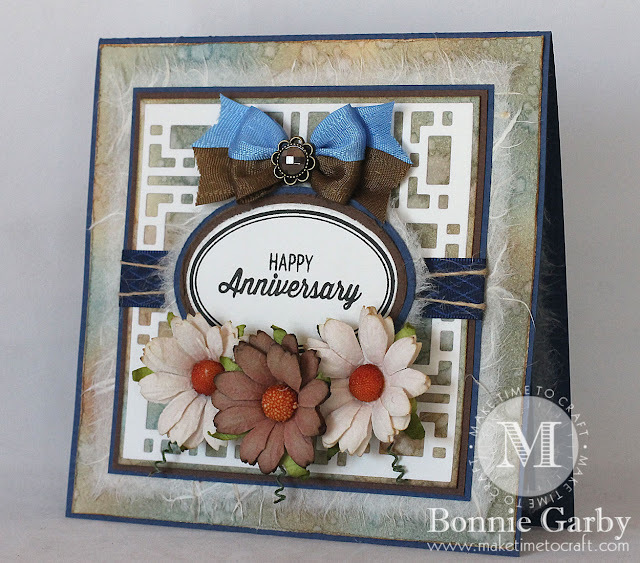 Beautiful card, I love your double bows!! !